GREEN BAY — The Packers offense got enough going in the second quarter to score twice, but Green Bay still trailed Philadelphia, 39-14, at halftime of Saturday night’s preseason game at Lambeau Field. The Packers finally got on the board early in the second quarter on a 1-yard TD run by James Starks. Before the quarter change, Starks had gained 25 yards on a screen pass, and then WR Jeff Janis hauled in a 29-yard pass from QB Brett Hundley, who was roughed after the play. The penalty moved the ball to the Philly 12-yard line, and the Eagles had two more defensive penalties, giving the Packers first downs. The first one wiped out a deflected interception. The last one, a defensive pass interference in the end zone on a pass intended for TE Richard Rodgers, put the ball on the 1 for Starks to finish the drive. The Packers defense finally got a stop, though the Eagles with backup QB Mark Sanchez did drive to the Green Bay 25-yard line. The Packers stopped RB Ryan Mathews on a third-and-1 run, and Mathews was flagged for a facemask on top of it, leading to a punt. 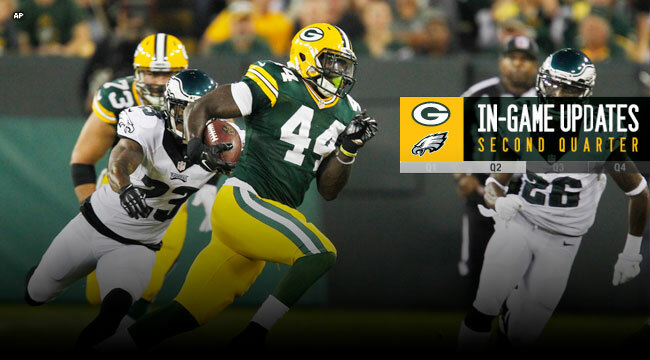 After another Packers punt, the Eagles struck again, driving 55 yards in 11 plays for a TD. An offside penalty on Packers NT B.J. Raji on third-and-1 from the Green Bay 34 proved costly, and Sanchez found WR Jeff Maehl for a 9-yard TD pass with 3:04 left in the half. Hundley answered with his second TD drive of the quarter. A screen pass to RB Rajion Neal gained 18 yards to start the drive, and another screen to Neal for 36 yards produced the score. In between were completions for first downs to TE Richard Rodgers and WR Myles White. K Mason Crosby’s PAT pulled the Packers within 32-14 with 1:01 left in the half. But the Eagles weren’t done. A 50-yard screen pass to RB Kenjon Barner jump-started another scoring drive. Maehl added 19 yards on a WR screen, and CB Casey Hayward was flagged for pass interference near the goal line, putting the ball on the 2. An illegal formation penalty on the Eagles wiped out Barner’s TD run, but Sanchez found TE Trey Burton for a 7-yard TD with just 4 seconds on the clock. The PAT made it 39-14.